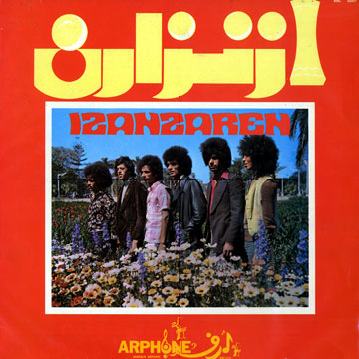 Izenzaren is a Moroccan Amazigh band founded in 1972 by six musicians. Characterized by a raw and hypnotic sound based on traditional berber music featuring virtuostic banjo playing, heavy drumming and lo-fi production, Izenzaren is still present in the musical scene appearing at numerous festivals and cultural gatherings in Morocco and other countries. While it is at this point very difficult to find information or translations about the band in English, I can only hope that with the current wave of interest in other Amazigh and Saharan bands (such as Tinariwen) they will eventually gain the recognition they deserve. In the field of Amazigh (Berber) music, the experience of the group Izenzarn presents certain characteristics. The emergence of this group occurred in the general context of the social changes in the post-colonial Morocco. The emigration (rural migration in the Moroccan sociological terminology) became an irreversible phenomenon. The rural society settles in the town and is confronted at the same time with the violent process of integration and assimilation and with the social problems resulting from the arbitrary management of country by the makhzenian Mafia. This situation requires the invention of new forms of poetico-musical expressions (or the adaptation of the old forms) to express at the same time the nostalgia of the origins and the anger towards the abusive policies. Also, at this times, Anglo-Saxon musical groups (such as the Beatles) as well as Moroccan groups (Nass el Ghiwan, Jil Jilala, etc.) impose their rhythms and influence the development of musical groups known as popular. Mixing modern and traditional instruments, these groups interpret songs, inspired by the ancestral tradition or expressing the current sensibilities of a generation coming from the first wave of the rural emigrants. We are like grasshoppers taken between the skies and the dry grounds. The success of the group is due to its strange musical style and the poetry of its songs that presented already at the end of the Seventies the germs of a revolution in the modern Berber poetic creation. After a disagreement, the group had split. Two groups dispute the name: Izenzarn Iggut Abdelhadi and Izenzarn Shamkh. But, it is the first one that imposed itself due to the emblematic image of its main singer, Iggut Abdelhadi.